Hop Brook starts just to the east of Grove Street in Framingham and flows west and north, passing through the Garden in the Woods and eventually discharging into the Sudbury River in Wayland. 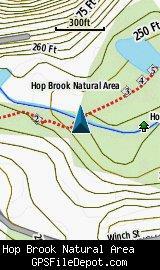 The Sudbury Valley Trustees owns a small parcel of land along Hop Brook, close to its headwaters. The trail map / brochure at the link above has interpretive descriptions of the numbered stations on the map. Download the brochure and follow along on your hike! 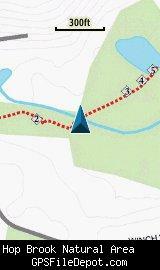 b) this KMZ includes the interpretive stations on the Hop Brook trail (the NW Framingham KMZ does not). This KMZ map is set to Draw Order 45 (as described above).